More than a dozen new home/personal computers made their debuts at the recent Winter Consumer Electronics Show in Las Vegas. This four-day extravaganza seemed to fulfill many of the predictions of a home computer revolution we've been hearing for the past several years. Last August COMPUTE! published an article about "The New Wave Of Home Computers," a growing collection of new models that would usher in the much talked-about age of home computing. It's not a wave – it's a thundering flood. The home computer revolution that has been dismissed by some as a fantasy or a fad is finally surging forward. At least, the equipment is now here to fuel it. The evidence was unavoidable during four days in January at the Winter Consumer Electronics Show in Las Vegas, a huge exhibition of the newest leisure electronics equipment that will be sold to Americans in the coming year. There – among the stereo systems, videotape recorders, video cameras, big-screen TVs, remote telephones, and myriad other gadgets – were the new home/personal computers. More than a dozen of them, in fact. By their glamor, at least, if not by the sheer numbers of people crowding their displays, they stole the attention of the show. One of the show's daily news bulletins predicted that this year's exhibition would be remembered as "the year the home computers came to town." And come they did. An estimated 70,000 attendees witnessed the introductions of three new models under $100, including the first under-$100 color computer; the first 48K memory computer for under $200; the first portable computer with 64K, built-in disk drive, and TV screen for under $1000; the first 12-voice add-on synthesizer keyboard for under $100; the first accessory voice synthesizer for under $100; and the first computer-controlled "home robot" for under $1000. Commodore's announcements dominated last summer's shows; and, although competitors grabbed much of the spotlight at this one, the industry's fastest-rising company had even more bombshells to drop. 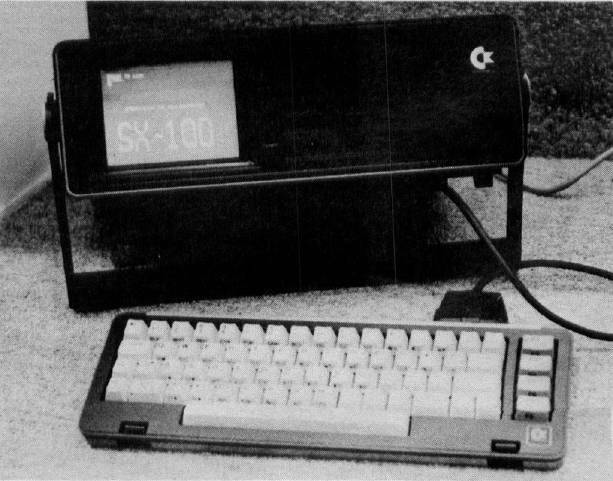 Topping the list was the SX-100, a portable version of the popular Commodore 64. Essentially, Commodore has taken the insides of a C64 – including the 64K of Random Access Memory (RAM), the 16-color graphics, and the extraordinary music synthesizer chip – and stuffed it all into a carrying case with a large handle. The top of the case unlatches and becomes a detachable keyboard you can rest on your lap. This then reveals a built-in five-inch TV screen – optional black and white or color – and either one or two built-in 170K disk drives. The SX-100 is completely compatible with the C64 and shares all its specifications. In fact, the prototype was running a C64 demo program showing off the color graphics, sprites, and synthesized music. The preliminary word from Commodore is that the black-and-white TV version with one disk drive will retail for $995, and the color TV version with two disk drives for $1295. 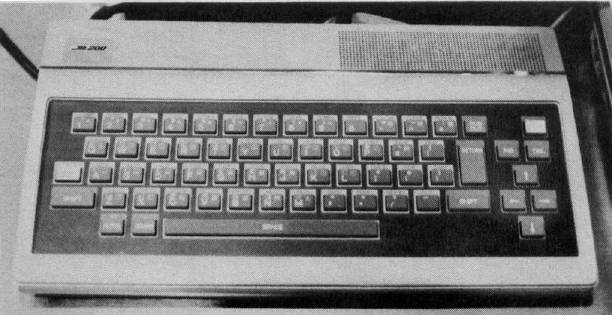 Commodore's prototype SX-100 with built-in color monitor and twin disk drives. Note the detachable lid/keyboard and carrying handle. Both can be plugged into an external TV or monitor or any other C64-compatible peripherals. Commodore suggests it will be available by April 1. It is likely to send Shockwaves throughout the portable computer market – remember that a coming plug-in cartridge will allow the C64 and SX-100 to use CP/M (Control Program for Microcomputers), the most popular operating system for business programs. The other new computer from Commodore is also a portable – the HHC-4 (Hand-Held Computer). This calculator-sized machine has an alphabetic keyboard arranged in the standard "QWERTY" (typewriter) format; a separate numeric keypad; a single-line 24-character liquid-crystal display; 4K of RAM (3K user-available), expandable to 16K; and 20K of Read-Only Memory (ROM) including BASIC programming language. 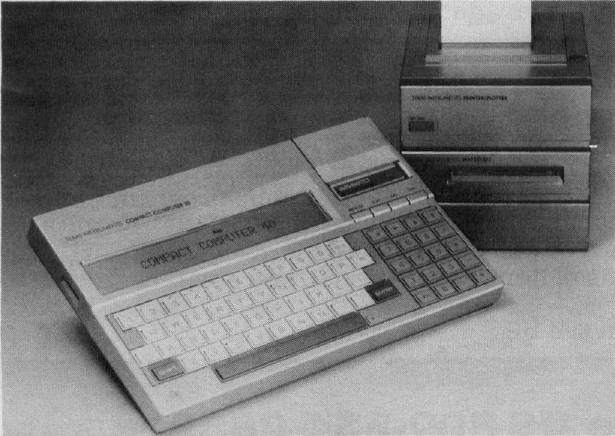 Commodore's HHC-4 handheld computer, plugged into its peripheral interface and printer. Experimental prototype of a VIC-20 with built-in Sony Watchman TV (upper left). Note that the keyboard has been shifted right to make room for the TV, and the four function keys have been displaced to the top. Commodore says this working prototype is only "an example of what could be done, not what will be done." By adding an RS-232 peripheral interface module (which includes a small built-in dot-matrix printer), you can hook up the HHC-4 to full-size printers, cassette recorders, and even a VIC-20 or Commodore 64. This means the HHC-4 can directly exchange data with your home computer. Another module allows the HHC-4 to display on a standard TV or monitor. Commodore says the HHC-4 will sell for $199. One of the most exciting peripherals at the show was a plug-in synthesizer keyboard for the Commodore 64. Lots of computer music enthusiasts have been waiting for this, since the C64 has the most advanced sound capability of any home computer, thanks to its synthesizer-on-a-chip Sound Interface Device (SID). 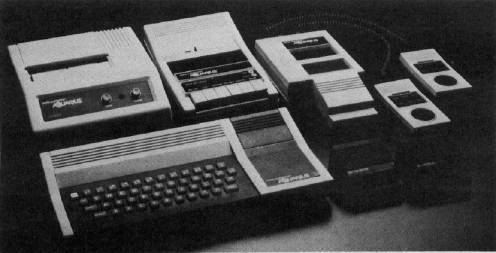 SID has three voices with programmable waveforms, filters, and envelopes (see "A First Look At The Commodore 64," Parts One and Two, COMPUTE!, August and September 1982). The full-size, organ-style keyboard attaches to the C64 via a black box that contains no less than three additional SID chips, for 12 voices in all. And the software is equally advanced. From the C64's keyboard, you can change waveforms, octaves, and even save what you play in RAM memory for later playback – even playing duets with yourself. Even more amazing, this entire package – organ keyboard, additional SID chips, and sophisticated software – is scheduled to be available sometime this spring for under $100. A built-in educational program, A Bee C's, uses clever graphics and speech to teach the alphabet to preschoolers. The graphics animation and speech are simultaneous. The voice module also works with other cartridges; Commodore is preparing a new series of talking educational programs and games. Another music peripheral is the Digi-Drum for the C64 and VIC-20. This three-pad synthesized drum kit simulates a snare drum, bass drum, and "high hat" cymbals. Drawings of the instruments appear on the TV screen and flash as their pads are thumped. Drum routines can even be saved and played back later. Put the Digi-Drum together with the synthesizer keyboard, and you'd have a pretty effective one-man band. The Digi-Drum is promised for this spring at $59.95. 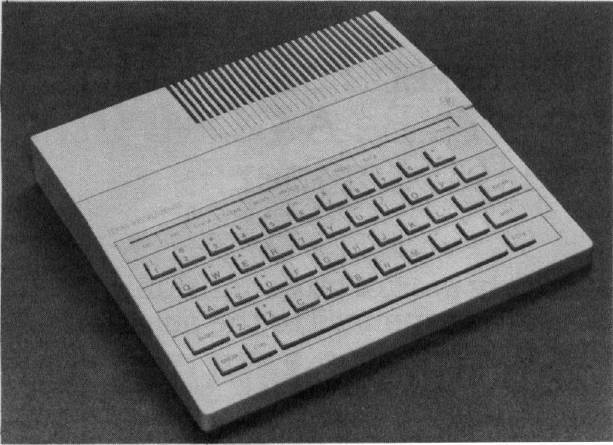 Other new Commodore peripherals include a $199.95 four-pen printer/plotter for the C64 and VIC-20 (available immediately), and a $299.95 13-inch color monitor (promised by March 1). Commodore also released the $19.95 Commodore 64 Programmer's Reference Guide, and more VIC-20 and C64 software than we have room to mention. Commodore has also started marketing the C64 in the same way that it currently sells the VIC: through mass retailers. Although Commodore officials refused to discuss prices, this marketing move means discounters will begin slashing the C64's price – perhaps soon as low as $399. Since many full service computer dealers do not compete with this kind of discounting, Commodore is releasing the new P Series exclusively to dealers. The P Series comes with 128K of RAM, expandable to 896K, and has the same 40-column screen, color graphics, and sound as the C64 (for details, see "The New Wave Of Home Computers," COMPUTE!, August 1982, and "Editor's Notes," July 1982). When the P Series was announced last summer, the price was set at $995; but now Commodore says it will sell the machine for $795. In the manufacturing area, Commodore announced yet another important move: it has signed an agreement with Zilog to co-produce the chip manufacturer's Z 8000 microprocessor, a 16-bit version of Zilog's extremely popular Z 80 microchip. Why? Commodore plans to build a new generation of 16-bit computers around the Z 8000. Expect the first models to be announced by the end of this year. For the past year, the $99 Timex/Sinclair computer has had the under-$100 market all to itself – and it has been selling by the hundreds of thousands. But that is about to end. Three new computers retailing for $99 were shown at the show, including the first one with color. The color model is the VZ200, the first home computer from Video Technology Ltd., a company with two factories in Hong Kong. Promised for delivery by April, the VZ200 comes with 4K of RAM, expandable to 16K ($45) or 64K (price not yet determined). Its 12K of ROM includes Microsoft BASIC, with one-touch entry of BASIC commands from the keyboard (similar to the Timex). The Central Processing Unit (CPU) – the microprocessor chip that is the "brain" of a microcomputer – is the widely used eight-bit Z80. Video Technology's VZ200, the first under-$100 color computer. Unlike the Timex, its established competition, the VZ200 has a real moving-key keyboard. Not quite a full-stroke typewriter keyboard, but partial-stroke, calculator-style keys made of rubber. No less than six of the new computers at the show sported rubber keyboards. The keys are soft and wiggly to the touch and feel sort of like pencil erasers. The VZ200 has a text mode of 32 columns by 16 rows, a mixed graphics/text mode with a resolution of 64 by 32 pixels (screen dots) with nine colors, and a high resolution graphics mode of 128 by 64 pixels with eight colors. There's a single-channel sound output, also unique among under-$100 computers. Other VZ200 features: full-screen editing; 600 baud interface to any standard cassette recorder; RF output for TV sets and video output for monitors; auto-repeat keys; keypress "beep"; and keyboard character graphics. Peripherals promised for later this year include a printer interface module, printer, joysticks, light pen, telephone modem, disk drive, bar code reader, and a monitor. Video Technology is preparing 29 software packages on cassette, and says about a third will be available when the computer hits the market. The programs range from educational and entertainment to home management and simple business. They will sell for $9.95 each. Video Technology also is introducing to the U.S. market a video game machine convertible to a home computer which it has been selling in Europe and Australia for a year. Called the CreatiVision, the game machine will sell for $189 and includes a membrane keyboard on the joy-sticks. The addition of a $10 BASIC cartridge turns it into a 16K RAM computer, and a plug-in keyboard (with rubber keys) will be available for $30. The video game graphics looked excellent. However, the BASIC is not compatible with the VZ200. Another significant entry into the sub-$100 field is the $99.95 Texas Instruments TI-99/2, available in the second quarter of this year. It, too, has a moving-key, calculator-style, rubber keyboard. It comes with 4.2K of RAM, expandable to 36.2K. Although it lacks the color, sprite graphics, and sound of its elder cousin, the TI-99/4A, the BASIC programs are "upward-compatible" – meaning TI-99/2 programs will run on a TI-99/4A, but not necessarily vice versa. It accepts software on cassettes or plug-in cartridges, though not the same cartridges as the TI-99/4A. Fourteen cartridges have been announced for entertainment, education, and home management. The computer's CPU is a Texas Instruments 16-bit chip – making it the first 16-bit computer for under $100 – though it is not the same chip found in the TI-99/4A. Texas Instruments TI-99/2, with 4K of memory for $99. One of the most interesting things about the new TI is its line of peripherals. A connector on the back accepts a new family of add-ons, including an RS-232 interface ($99.95), a four-color printer/plotter ($199.95), and the Wafertape drive ($139.95). The Wafertape drive uses "wafers," small endless-loop tape cartridges familiar for years to TRS-80 users (and now other users) as "stringy floppies." Less expensive than a disk drive, a stringy floppy drive can store up to 48K on a wafer and is sometimes faster than a disk. (See "Mass Memory: Now And In The Future," on page 54.) The peripherals also will work on TI's new portable machine, the Compact Computer 40, and on the TI-99/4A (with a $59.95 "Hex-bus interface"). This means someone starting out with a low-end TI-99/2 can move up to a TI-99/4A without discarding the peripherals. TI's other new computer, the Compact Computer 40, is a hand-holdable battery unit. For $249.95, it comes with 4K of RAM (expandable to 16K); 34K of ROM containing an Enhanced BASIC compatible with TI's other home computers; a one-line, 31-character liquid crystal display that scrolls sideways to 80 characters; upper- and lowercase; QWERTY keyboard; memory retention when switched off; and a cartridge slot for plug-in software. TI says 75 cartridges will be available by the third quarter. Texas Instruments Compact Computer 40, a battery-powered 4K portable for $249.95. At right is the new printer/plotter, Wafertape drive, and RS-232 interface. The remaining $99 entry is one of three new Japanese computers introduced at the show, the Sanyo PHC 20. This compact model has a moving-key, rubber keyboard, 4K of RAM (unexpandable for now), 8K of ROM with a Tiny BASIC, 32-character by 16-line text display, 64- by 64-pixel graphics, full-screen editing, 1200 baud interface with any cassette recorder, and a monitor output that connects to a TV with an adaptor. The CPU is a Z80A. The PHC 20 is supposed to be available immediately through Sanyo dealers. Two similar Sanyos are also on the way. The PHC 10 is a battery-powered hand-held model with built-in liquid crystal display, 2K of RAM expandable to 4K, and a buzzer for simple sound output. Otherwise, it is almost identical to the PHC 20. No price or delivery date is available. And on the higher end is the PHC 25, a souped-up PHC 20 with 16K of RAM (expandable to 32K); 24K of ROM with a larger BASIC; additional graphics modes of 128 by 192 pixels and 256 by 192 pixels; parallel printer interface; joystick port; and three-channel sound output. It should be available at the same time as the PHC 20 for $199.95. Another exciting low-end introduction is the Timex Sinclair 2000, the first computer that offers 48K RAM for under $200. The T/S 2000 is basically the U.S. version of the Sinclair ZX Spectrum, until now available only in the United Kingdom. The T/S 2000's main improvements over its popular cousin, the $99 T/S 1000, are more memory, color, sound, and a moving-key keyboard. There are 40 rubber keys with upper- and lowercase, auto-repeat, standard Timex Sinclair character graphics, one-touch BASIC keyword entry, and the same editing functions as the T/S 1000. Separate keys control the colors of the screen foreground, background, and borders, with variable brightness and a FLASH command for blinking characters. A one-channel sound generator beeps through an internal speaker over 10 octaves. Other T/S 2000 features include a 16K extended BASIC, 256- by 192-pixel high resolution graphics, high-speed cassette interface (16K in 100 seconds), and a 32-column by 24-line text display. Timex says the T/S 2000 will be available this spring for $149.95 (16K) or $199.95 (48K). With that much memory at those prices, the T/S 2000 should prove an interesting competitor. Timex also introduced a 32-column thermal printer that works with both of its computers. The T/S 2040 printer reproduces full-screen graphics or text at the touch of a single key. It should be available immediately for $99.95. Timex also announced a $15 rebate (expiring March 31) for buyers of the T/S 1000. The Timex Sinclair 2000 is the first computer with 48K memory for under $200. Production models will have a topside cartridge slot for plug-in software. At right is the new thermal printer, which works with both the T/S 2000 and T/S 1000. The Japanese, largely left out of the U.S. home computer bonanza, were at the Las Vegas show trying to make inroads with new models, too. Besides Sanyo, Panasonic and NEC also had wares to exhibit. Panasonic's JR-200U comes with 32K RAM (unexpandable); 16K ROM with Panasonic's own BASIC; a 63-key partial-stroke rubber keyboard; 32-column by 24-line text display; eight colors; 64 graphics symbols labeled on the keyboard; 64 programmable characters; 64- by 48-pixel graphics; three-channel sound covering five octaves; two Atari-type joystick ports; Centronics-standard parallel printer interface; and outputs for TV, composite video monitors, or sophisticated color RGB (Red-Green-Blue) monitors. The Panasonic works with any standard cassette recorder at 600 baud, but a special recorder will be available for $89.95 that saves and loads at 2400 baud. The sound comes from an internal speaker rather than the TV, but an external speaker jack allows hook-up to stereo systems. The CPU is an MN1800A chip, equivalent to a 6802. Panasonic says the JR-200U will be on sale by March for $349. About 30 home-oriented programs also will be available at that time, and 70 more are promised by the end of 1983. Some peripherals also are due later in the year, including a 320K disk drive, an 80-column dot matrix printer ($369.95), an RGB monitor ($44.95), and an RS-232 serial interface ($69.95). 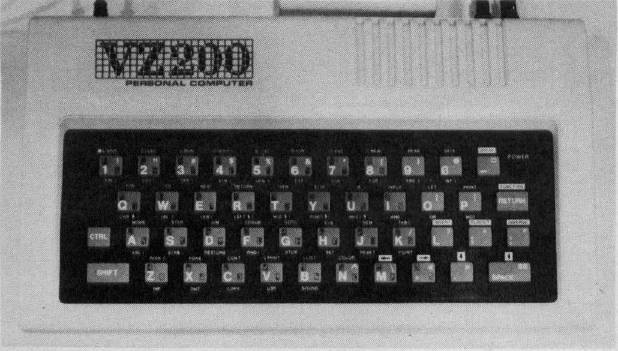 Panasonic's JR-200 features a rubber keyboard and 32K RAM. NEC showed its new PC-6001, due by the end of February, for $349. Early prototypes had a partial-stroke rubber keyboard, but production models were sporting a full-stroke typewriter-style keyboard with five programmable function keys. The PC-6001 comes with 16K RAM, expandable to 32K with a cartridge; 16K ROM, also expandable to 32K; 32-column by 16-line text display; three graphics modes, including 256- by 192-pixel black-and-white, 128 by 192 with "limited color," and 64 by 48 with nine colors; 600/1200 baud cassette interface; Centronics-standard parallel printer interface; two Atari-type joystick ports; TV and monitor outputs; three sound channels with an eight-octave range, plus a noise generator for sound effects; and a Z80A-compatible CPU. A number of peripherals also will be introduced for the PC-6001. A $99.95 expansion unit adds three slots for memory cartridges, disk controllers, etc. There'll be a disk drive ($599.99), a touch panel graphics tablet ($149.95), a 20/40-character thermal printer, a color monitor, and a tape drive ($99.95), although any standard cassette recorder will work. NEC also is lining up quite a bit of software from such well-known companies as Synapse, Datasoft, Datamost, Adventure International, and Courseware. There will also be an extended BASIC cartridge, a symbolic assembler for machine language programmers, and a $99 BASIC compiler on a cartridge. What's more, the memory expansion cartridges are RAM/ROM units with an extra empty chip socket, so they can be customized. Mattel, Inc., was showing its new Aquarius, an under-$200, moving rubber-key, 4K RAM computer expandable to 52K. Some people seem to be confusing this with Mattel's In tellevision add-on keyboard, but the products are entirely different. Besides showing off some educational and entertainment software, Mattel had an interesting direct-connect modem (about the size of a cigarette pack) which plugs into the cartridge slot. This will sell for under $100, complete with terminal software and a free subscription to the CompuServe data base. Mattel also is planning to introduce a higher-end version of the Aquarius later this year. Meanwhile, Spectra Video was exhibiting its new SV-318, a $299, moving rubber-key, 16K RAM computer expandable to 128K. The SV-318's were running some impressive graphics demos, and it turns out that the computer has the same graphics chip as the Texas Instruments TI-99/4A – 32 sprites and all. Mattel's new Aquarius and its family of peripherals. A non-working mock-up of Spectra Video's planned SV-328. This upgraded version of the SV-318 will have 64K RAM and sell for about $500. In a back room, out of sight from the crowds, Spectra Video had a mock-up of a higher-end computer, the SV-328. All software and peripherals will be compatible with the SV-318, but Spectra Video has replaced the rubber keyboard with a full-stroke typewriter-style keyboard, including a numeric keypad, and upgraded the standard memory to 64K, expandable to 128K. Special editing keys on the SV-328 are labeled to match commands in a new word processor being introduced by Microsoft. All other specifications – including the color graphics, three sound channels, CP/M capability, and 80-column adaptability – are the same as the SV-318. The disk drives for both computers will use the Xerox 820 format. The SV-328 should be available later this year for around $500. More details also surfaced on the new 64K Atari 1200XL (see "Atari's New Top-Line Home Computer," page 66). First, as expected, the price was set at $899. One Atari spokesman said that the 1200XL's 64K RAM chips accounted for 40 percent of its production costs, and since 64K chips should be dropping in price rather quickly, it's likely that the 1200XL's price also will drop in coming months. Another factor is that the 1200XL may be less expensive to produce than the 800, or even than the 400, once production gears up. The 1200XL contains all its components on a single board. The 400 has four boards, and the 800 has six. 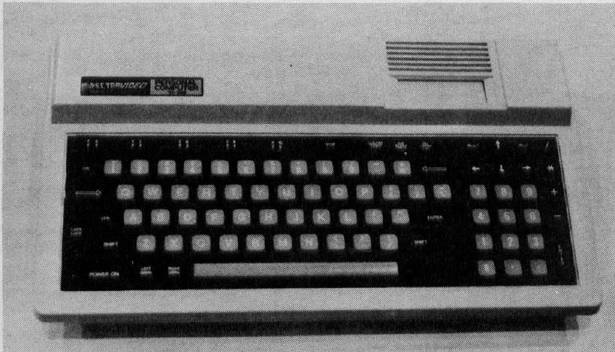 Although the 1200XL is compatible with the 400/800, it was revealed that the CPU is a custom version of the 6502 found in the earlier computers. The new CPU, code-named "Sally," has an extra line for the ANTIC chip. This means ANTIC and the CPU won't be fighting to access the same memory all the time, which means the 1200 XL should run faster than its predecessors. The 1200XL also has a different Operating System than the 10K OS in the 400/800. The new 16K OS uses its extra 6K for the diagnostic tests and four programmable function keys. In addition, like the Commodore 64, the OS is overlaid upon the 64K of RAM. This means you can disable the OS with a POKE to access the RAM underneath. Of course, this also means you'd have to write your own OS – not a trivial task. But software developers will be able to incorporate their own custom OS in their programs, freeing more RAM for workspace – as in a word processor or spreadsheet, for example. A maximum 62K of RAM is available when the OS is disabled (2K is still needed by the computer). Other new 1200XL features: an additional graphics mode, GRAPHICS E, to be supported by a new BASIC that's on its way; improved circuitry to sharpen the sound and colors; no more memo pad mode when the computer is powered up without a cartridge (a colorful Atari logo appears instead); and the transfer of all ports and plugs from the right side of the computer to the rear (except for the two joystick ports and cartridge slot, which appear on the left). The four new function keys can act as 12 -they work alone, or in combination with the SHIFT and CTRL keys. If they are not reprogrammed by the user, the default function of the keys when pressed by themselves are the four cursor movements – up, down, right, and left. This circumvents the CTRL key which must be held down when the keyboard cursor controls are used. Atari also is preparing new software to take advantage of the 1200XL's HELP key.